The epic story of Henri "Papillon" Charrière (Charlie Hunnam), a safecracker from the Parisian underworld who is framed for murder and condemned to life in the notorious penal colony on Devil's Island. 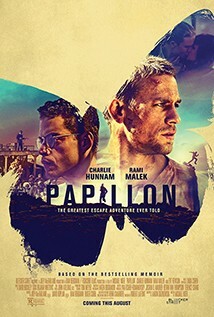 Determined to regain his freedom, Papillon forms an unlikely alliance with quirky convicted counterfeiter Louis Dega (Rami Malek), who in exchange for protection, agrees to finance Papillon's escape. The two struggle through many episodes, and in the end, Papillon and Dega’s care for each other will emerge as a celebration of humanity in adversity. This 2018 version of the story is visually richer and narratively tighter than the 1973 original, with the two new leads doing an impressive job to even be compared to Steve MacQueen and Dustin Hoffman.